Tom Clancy’s the Division 2 has been a breath of fresh air. As a gamer, the past year or two has been filled with promises of ‘vast open worlds’ and mountains of ‘content’ to chew our way through. Most of those promises have been empty, hampered by extensive ‘road maps’ or year-long plans. The Division 2 puts them to shame. This game is so packed full of content it actually makes me worried for my real-life responsibilities. Not only that, but the content here is actually good. It’s worth taking time to note that I’m just over 20 hours into the game, which is a substantial amount. It isn’t, however, enough to have completed the campaign or reached end-game by any means. As a result, this review won’t speak about end-game and I don’t know yet how the narrative concludes. Nonetheless, I’ve a good impression of what the Division 2 is, does and represents, and I feel in a good position to make a decision about the value of it as an experience. For those expecting to find out what the end-game loop is like, I won’t be discussing that yet, but I can say that it’s going to take you between 20 and 30 hours to get there, and from what we’ve seen, it’s going to have a substantial amount to dig your teeth into. Today, I’ll be walking you through what the Division 2 has to offer and scoring it based on what I’ve experienced so far. I should mention that I was kindly given a review copy of the game, but I assure you that this is my absolutely honest opinion nonetheless. Without further ado, let’s dive into The Division 2 and what you can expect. First thing’s first. The gameplay is solid. It feels like the Division, but more streamlined. Most of your time will be spent killing waves of enemies, but it really never gets old. Enemy diversity is actually great, especially considering the genre. Even before unlocking the fourth faction at the end of the campaign, the three factions feel distinct and characterful. The Sons will brashly rush at you, aggressively pursue you and actively flank you – all while shouting a steady stream of expletives. And nothing feels better than putting an enemy in the dirt who’s just told you he’s going to do the same to you. Your skills are a key component to your success, and while I’ve heard some complain that they can be a little clunky, I’ve generally found them to be really excellent. There’s enough diversity here to keep players going for ages, and I’ve not even dived much into mods yet. Teams will have tons of fun finding roles and combinations that work extremely well, and I’m sure there will be a good variety of those too. This is all before we’ve even considered Specialisations, which are almost like end-game classes, or item sets, too. More on those in my end-game review (soon! 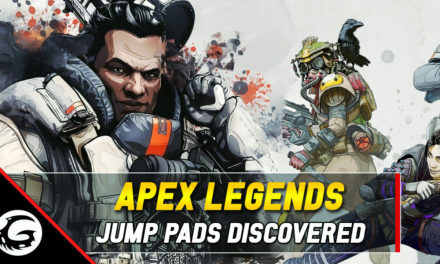 ), but I can say that I really like the ‘branding’ system on loot, which reminds me of the old Borderlands loot by providing bonuses based on the item’s manufacturer. It even rewards you for wearing multiple pieces by the same one. Weapons, and wider loot, are varied and interesting. Gear drops are genuinely exciting, and surprisingly generous. There’s a lot to sink your teeth into here, and that’s just icing on the cake considering how satisfying and snappy combat feels, looks and sounds. This is a world that keeps you in the dark just the right amount. The sound, in general, is a really underrated element of the experience. Thankfully, the audio bug from the beta is gone. Now we have real audio-cues and interactions that will genuinely impact how you fight and move in combat. Enemies will ask others to cover them while they move, alerting you that they are about to dash between cover. At other times, enemies might declare that they are flanking, and will actually begin to move around the outskirts of the fight to counter your cover. My most impressive example of this was when fighting an enemy that took a moment to reload behind cover. During that time I snuck away to another piece of cover myself. The enemy then stood up to re-engage me, and even sprayed a few bullets before detecting that I had, in fact, vanished. They then shouted out “I’ve lost him!” and began to search around. Aware of my hidden vantage point, I could now easily dispatch the clueless enemy. Those elements themselves are not that impressive, but it’s the micro-interactions in combat that make for a truly responsive, engaging experience. These enemies won’t run straight at you, they’re smarter than that. Real attention to detail has been used here. From enemy design, to sound; it all works. Ok, some will run at you – but those ones are clearly insane. By that regard, there are a good number of enemy types that will also change the way you need to react in combat. When fighting snipers, you’ll need to pay careful attention to lines-of-sight and engage in short bursts. Meanwhile, against the ‘rusher’ type enemies, you’ll need to take them out before they reach you, demanding mobility from you. There are different types of these enemies for each faction, too – the Sons melee-types are drugged-up maniacs who will charge you down with their melee weapons, whereas the Cult’s ‘rushers’ are suicidal bombers with liquid-charged explosives. Those explosives are, foolishly, carried in a big canister at their hip. Shooting this canister will cause it to burst open, dowsing them in flammable material. Other enemies might be found carrying explosive fuel-tanks for their equipment, or grenade-belts that, once triggered, set off a chain-reaction of explosions that can catch other enemies and even environmental pieces in the blast. Each enemy type is denoted by a little role icon next to their health bar. You’ll quickly gain a sense of hatred for a few of these types, but knowing what they can do is half the battle. There’s a lot to interact with and think about in combat, so you’ll genuinely always be engaged. That’s something that The Division 2 really gets right. You won’t be mindlessly mowing down waves like you might in Anthem or even Destiny. Instead, you’ll have to methodically take down enemies. 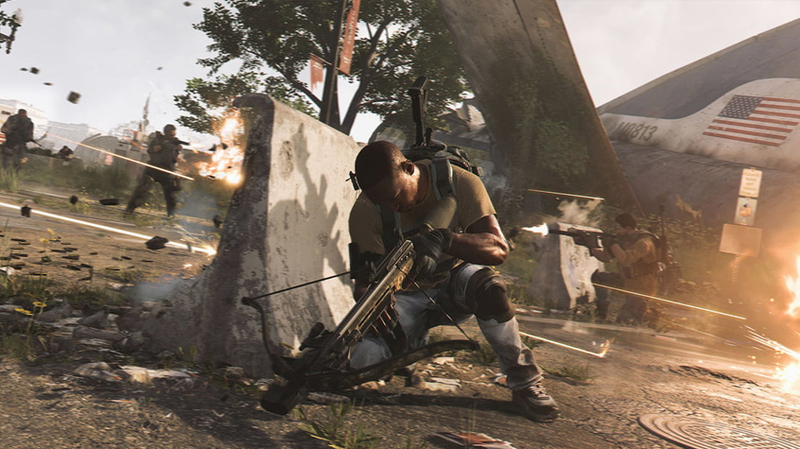 Time to kill is much-reduced versus the Division 1, and the Division 2’s competitors too. You’ll feel rewarded for accurate play and good use of your skills and cover, which is how it should be. The cover system is snappy and intuitive. Cover is a big part of your success here, just like in the first game. The cover system is snappy and responsive – much like the rest of The Division 2’s controls. In particular, using the system to move between pieces of cover feels intuitive and genuinely helpful. Enemies will use the cover, too, and often infuriatingly well. You’ll need to take shots at them as they dash from cover-to-cover, much as they will against you. It really feels like a level playing field, with all the elements at your disposal. Hitting enemies, and shooting in general, is equally responsive. Guns are much improved versus the first Division, and shots really feel like they land. Enemies always react to being hit, which makes even the spongier boss-enemies feel like you’re really doing something to them. I didn’t mind, or even feel really, the sponginess in The Division 2. The audio/visual feedback is so good that you know exactly when you are hitting an enemy, and the newfound armour system makes accuracy against bosses feel rewarding. Shooting the same armour piece will eventually break it, opening that enemy up to health-damage. That’s actually a really cool system, and probably the one that makes the most sense of any that I’ve ever seen. 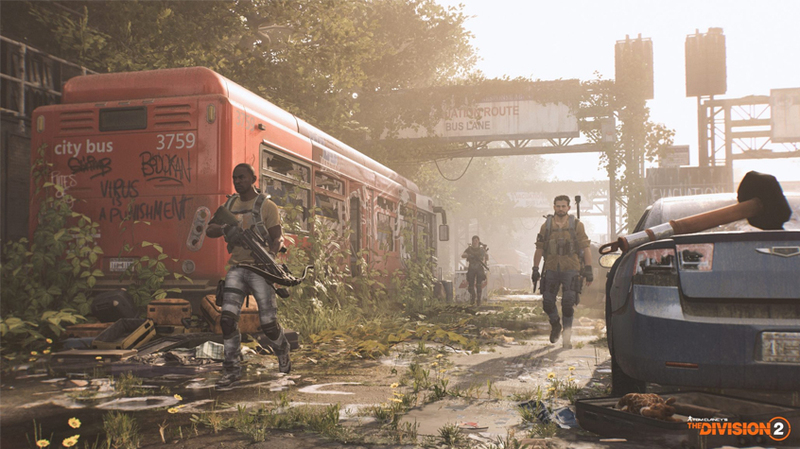 All looter-shooters have come into the problem of damage-feedback and sponginess, but The Division 2 strikes a really effective balance. Boss Encounters are tough, but amazing moments. If you mindlessly pour bullets into an enemy boss, it will take ages to kill. But if you strategically remove a piece of armour, target a weak-point or even destroy an explosive element on the boss, you will be actively rewarded. You can even see that progress in the boss’ reaction, not just their health bar. Boss variety is a little low. They effectively embody larger, tougher variants of the regular enemy archetypes. There are melee bosses, sniper bosses, bosses with grenade launchers, and ones with gadgets. You will, however, have to fight each one differently – and the developers have done a good job setting up those encounters. Two separate things make these encounters special. Firstly, the game does an excellent job of explaining who it is that you’re going to fight, and making you really, genuinely want to take them down. Secondly, the developers have ensured that boss fights quickly become more varied, with different angles, landscapes, and even lighting. In one encounter, a boss cut all the lights in the room I was in, before bursting in and declaring his ill-intent. He then pursued me with a grenade launcher that burst into flames when it landed. This was not only terrifying, but it also provided light. Each time he fired, the room became increasingly bright, and also increasingly engulfed by flames. These encounters are really enjoyable conclusions to the missions, and I hope the devs continue to make new ground with them, because there’s good scope here. Arguably, there’s not a lot that can be done to make the bosses themselves more than beefier, more deadly enemies. But that doesn’t mean that the encounters themselves can’t be incredible, though, and many of them have been so far. Get ready to feel like your very own action-movie hero. Speaking of missions, those are vastly improved, too. The story missions are incredibly well put-together. Each one is like its own movie set-piece, complete with a deep tour of Washington D.C.’s most interesting landmarks and sights. You’ll be fighting your way through the Air and Space museum, The White House, Lincoln Memorial and other stunningly-realised spectacles. Side missions, too, are surprisingly well scripted. I’d say they’re even on par with the missions from The Division 1. The main missions from Division 1, I mean. They are that good. Ultimately, you’ll always be working your way into a zone, killing an end-boss or elites, and/or capturing something your settlements need to improve life in D.C. Somehow, however, the devs have managed to keep each new one fresh, with a new location and new things to do or see. The game’s difficulty is substantial, especially for solo-players, but not insurmountable by any means. Veterans of the series will have no trouble working their way through the content, while for new players there’s something of a shallow learning curve. I was initially worried about playing solo in the lead up to release, while levelling and experiencing the story. Those worries were unnecessary, however, as the difficulty scaling is tough but fair. There’s also the ‘Call for Backup’ feature now, where downed players can send out a signal asking for another player’s aid. That player can respond, revive the downed player and then lend a hand. Now that’s a clever idea, and one that’s so seamlessly integrated that you could be forgiven for forgetting about it (at least, until you die). Missions where I died often needed a new tactic or angle to defeat a particular new challenge. One instance was a heavily armoured boss covered by multiple snipers, where taking time out of cover to break his armour meant surely getting my head exploded. A respawn and a change of cover, as well as skills, later – and I was good to go. That decision-making process feels reactive and organic, and that’s how it should be. The story is slow and methodical, but when has Ubisoft ever rushed story? This isn’t your average filler, fetch-quest or hold-this-area rubbish. There is some of that which occurs in the world events, but those are usually welcome distractions. The story missions, instead, feel like deeply-scripted sequences with a point to prove. The team seems to have really embraced their new location and relished the chance for us to see as much of Washington as possible. At times, I thought the missions felt like they weren’t directly relevant to the narrative. But then I realised that Ubisoft isn’t in any rush here. They are more than happy to elaborate on enemy factions and areas, one mission at a time. The story does develop over the course of your many tasks, however – and I’m excited to see where they take it. No spoilers, but I’d suggest keeping your wits about you; not everyone is someone you can trust. It’s worth noting that some publications were claiming the story to be up to 40 hours long leading up to The Division 2’s release. I’m sure you could make it that long if you wanted to complete every side mission, and those missions would certainly be worth your time. 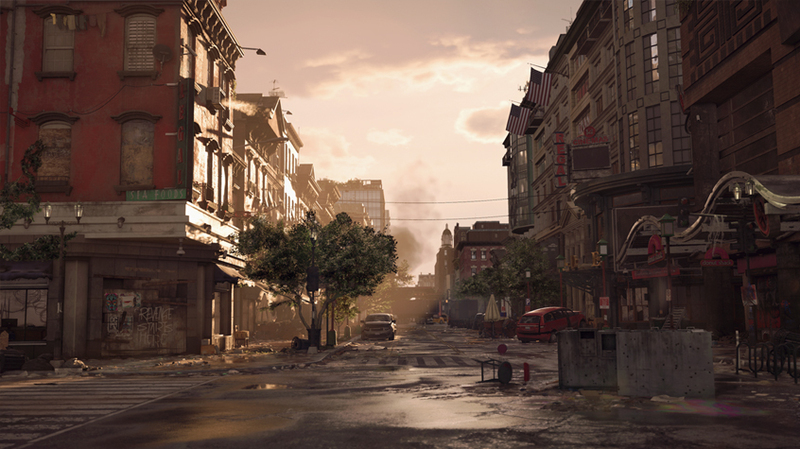 Most players, however, will find themselves completing the story in around 20-30 hours, depending on your familiarity with The Division and how much help you get from groups. That’s not to be sniffed at, especially when none of it is mindless filler. 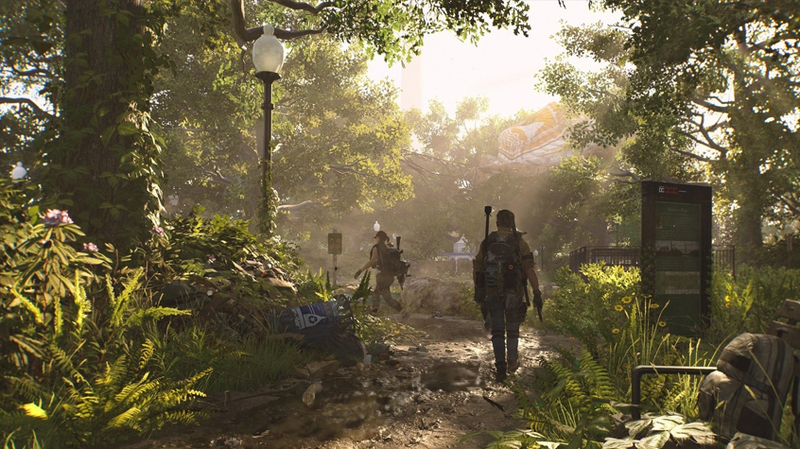 It’s all relevant, engaging narrative content and that’s a real surprise amidst The Division 2’s competition. This is a Washington tour like no other. 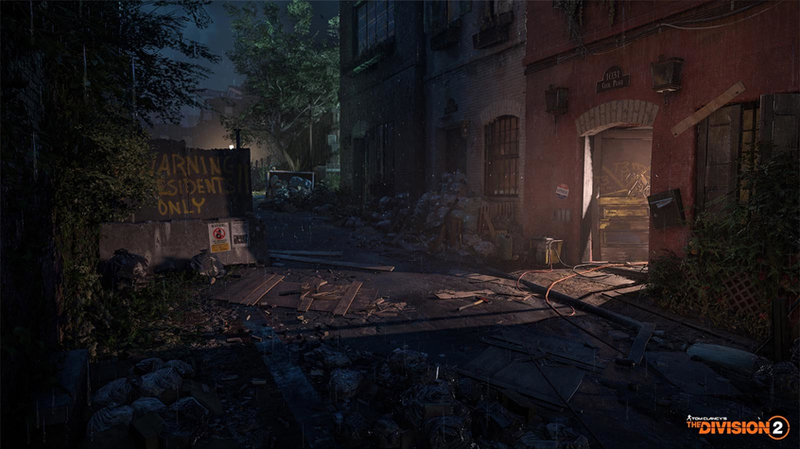 I’m not going to rave about graphics in 2019, but one thing is for sure: The Division 2’s environments are incredibly detailed. It’s the little touches that really make a difference, and tiny pieces of narrative can be seen wherever you go. Whether it’s a suitcase stuffed hastily into a bin, the sprawling mass of messages on walls or ruined landmarks, the game rewards an eye for detail at every level. 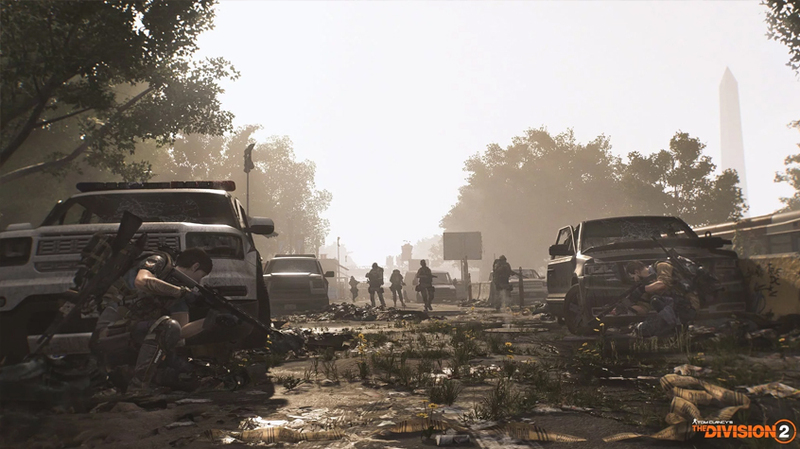 Exploring the many landmarks of The Division 2 is a treat itself, and the subtle dialogue about the degradation of American society is an interesting, and bleak, outlook. I don’t want to know how long the developers spent brainstorming what D.C. would look like after a disaster like this. I imagine their journals to be terrifying. Their vision has carried through, and exploring Washington is an absolute treat. The world feels like its living and breathing. Settlements actively improve with each completed mission. Raiding for batteries means they now have the use of solar panels. They get a wind turbine, plants, and a games area for kids – all because of you. There are some really handy tools at your disposal, too. The Firing Range is unlocked after you rescue the NPC to run it, and it’s a great place to test out builds and new weapons; that’s something which is extremely useful in this kind of stat-driven game, and a feature that all other titles in the genre have neglected to include. You’d think a place this dirty would have more bugs? OK, on to the bad stuff. Erm…. There really isn’t much. The game runs incredibly well, and despite a few minor bugs I’ve had no problems really. I’ve heard some complaints about the menus, but they feel intuitive enough to me. They’re also really snappy, and a lot of commands can be done before the menus are even up or down, which is nice. Transitions are short and snappy again, and the navigation is plain-sailing. There’s nothing like the bogged-down mess of Anthem’s menus here. In fact, The Division 2 has had a comparatively flawless launch. I’ve been assured that most, if not all, of the bugs will be patched on the day of release, too. 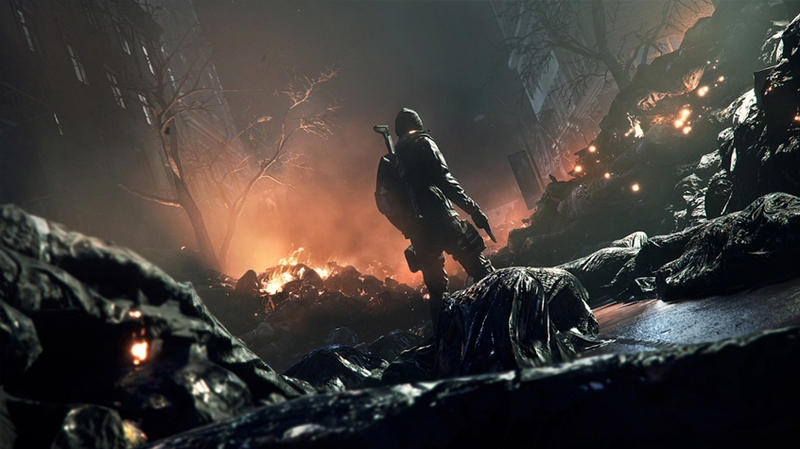 This is The Division, after all, so we expect it to have the odd unusual interaction – and with a game this size, there are always going to be a few strange things to be ironed out. Largely, however, I have no complaints about bugs at all. I had one interesting one where I couldn’t cast a skill, which threw me. It was quickly resolved by re-binding the skill, however, and that’s probably the worst example I can think of. There have been examples of more damaging bugs experienced by other players, but it looks so far like the dev team is responding quickly and efficiently. Some bugs found this week have already been patched out, which is incredible. Clearly the team is on top of things, and hopefully that continues. Endgame review yet to come, but it looks amazing so far. As for The Division 2’s endgame, I honestly haven’t experienced it yet. Don’t worry, I’ll be releasing a full update once I have (probably next week). What I do know is that the game changes radically once you complete the story. 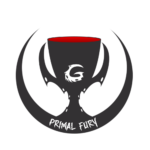 A new faction, the Tusks, moves in to fight for control, and they mean serious business. Meanwhile, a plethora of options await players once they hit max level. 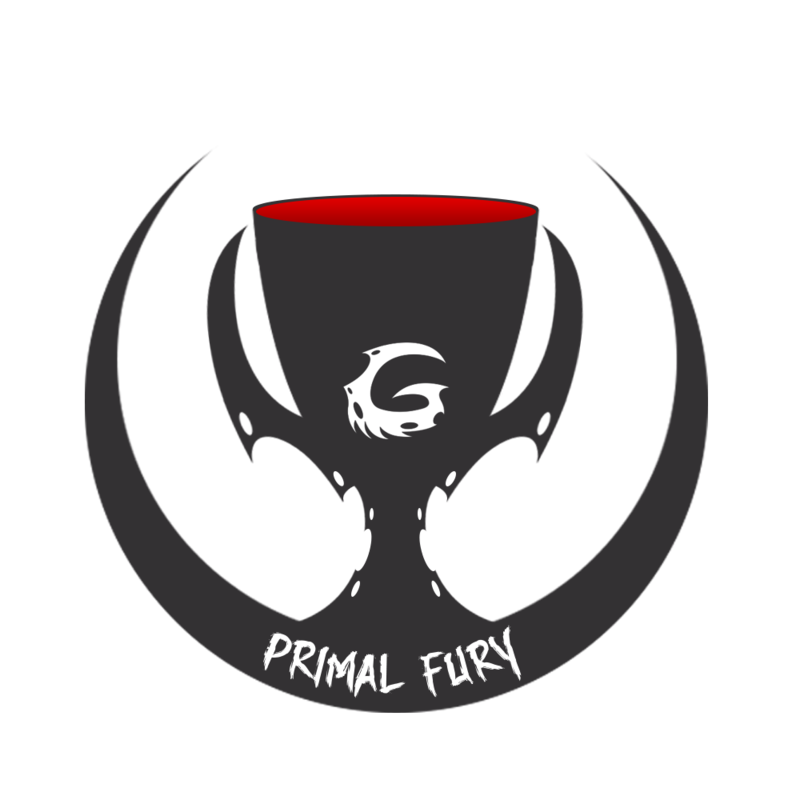 The map updates with a complete new set of tasks to complete; raw PvP has two modes; there are three Dark Zones, with a rotating event in one at a time; Specialisations; Exotic Weapons; Mods and Item Sets all to play with. Oh, and did I mention that there are three lengthy Stronghold missions in addition to all that? For some games, three Strongholds is supposed to be enough. For The Division 2, the sky is the limit for end-game content. 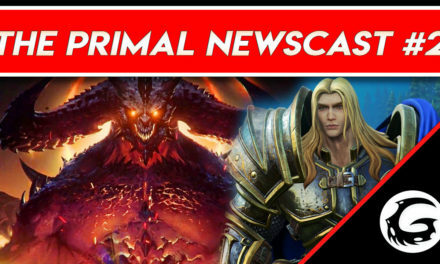 We’ve even got confirmed 8-player raids coming, as well as free, regular story updates. I’ll report back once I get there, but it seems like this is easily the sort of game that a player could sink hundreds of hours into. Competing titles need to hunker down. The Division 2 is coming and it means serious business. 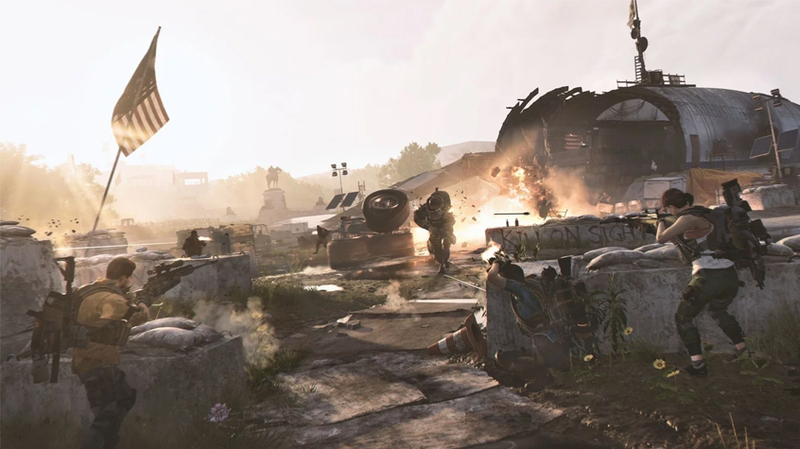 The Division 2 was a real treat for me, and I was not expecting the level of polish that is evident nearly everywhere. The game isn’t perfect, but it’s absolutely worth experiencing. For those new to the genre, I’d argue that The Division 2 is the perfect entry point, with enough longevity to carry you far off into the horizon. It isn’t the prettiest game this year, nor does it have the most instantly gripping storyline. What it does have is the steady drip-feed of loot-fulled glorious-ness that we really want from a looter-shooter. The Division 2 really gets it right. For once, fans of the genre have a complete experience to pick up and play that isn’t going to take years to get to a satisfactory point. And even more, it only promises to get better from here. I’m already excited to play more. Even as I write this review, talking about what I’ve done so far in just the last few days; I can’t wait to jump back in. That’s a feeling that I haven’t really experienced with a game in a long time. In a world of Anthem’s, Fallout 76’s and Fortnite’s, The Division 2 is a welcome change of pace. This is a world that demands your attention. This is a captivating, ocean-deep experience that harks back to the Skyrim-days of open-world games. 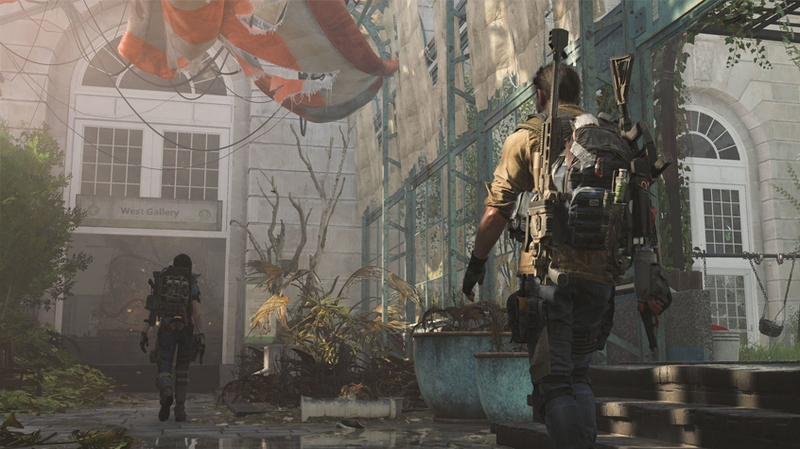 The Division 2 improves vastly on its predecessor, and the games that make up its competition. Those games should be shaking in their boots, because The Division 2 is coming, and it isn’t going to stop until it sits atop the throne. I’m giving The Division 2 a bold 9 out of 10. That’s not a score to be handed out lightly, but I really think this is a game that deserves it. 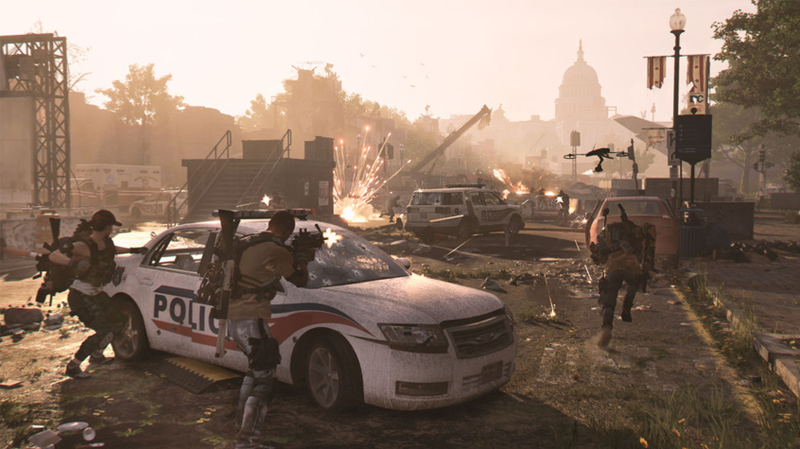 The Division 2 is a new, higher bar of quality being set for the genre, and even wider beyond. 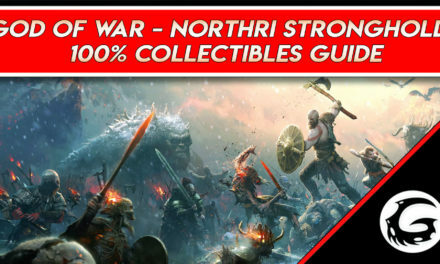 I’m aware that this review is sounding like something of a love letter to the game, and you know what? It is. Gamers have been consistently stung with over-hyped releases that haven’t lived up to their expectations over the last couple of years. This is not one of those games. If you’re a fan of shooters, open worlds, or RPG’s individually, The Division 2 has something truly captivating for you. If you like any combination of those, or all of those, The Division 2 is a gaming-feast waiting for you to dive in. 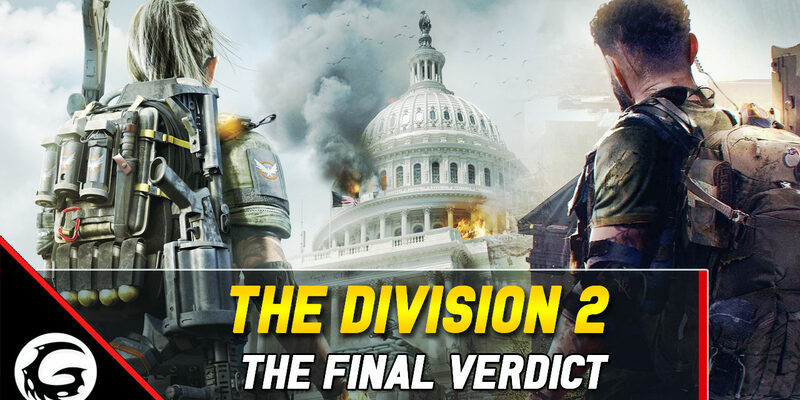 Alright, that’s it for my Division 2 review. Phew! It’s one of the most positive game-release experiences I’ve had in a long time, and bodes extremely well for the game’s future. I’d say it’s an extremely good value purchase even right now, with even more to come along the horizon. If you liked the review, drop us a like and Subscribe for more Division 2 content coming right your way.